A nominally “satirical” site that clearly intends to mislead readers, generally with an anti-Trump/anti-Republican slant. 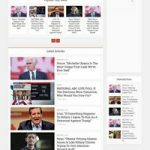 Their “About Us” page says: “We are hybrid News/Satire platform to provide the latest and breaking news for for Political, Government, Cultural, and Religion news”. This is very similar to Newslo’s disclaimer, although there’s no indication that there’s a connection between the two sites. In general the quality of the writing is far inferior to Newslo, suggesting that USPOLN is merely a ripoff.